SUPER SLOBBER DOG! is an iPhone game I worked on creating Graphic and UI designs. I also directed and created the game play trailer which you can watch below. Since parts of the game take place in WW2 we wanted to incorporate a propaganda poster style to all the art. 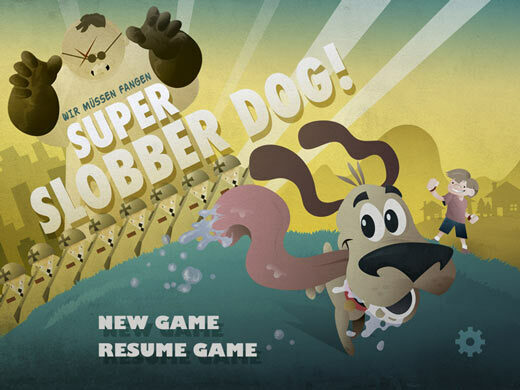 Like a Saturday morning cartoon mixed with pong and brick breaker, SUPER SLOBBER DOG sends you on an epic quest through time and space to return a mysterious pup to his home in Germany. Hunted by 10 evil dog-nabbers, blocked by bark matter and power balls yanked from space, you’ll spend the entire journey within licking distance of the most slobbery friend you’ve ever had.